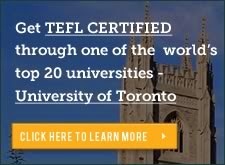 $100 discount on the University of Toronto's online course until July 31st! Offer ends midnight July 31th, 2014! The discount has been extended to the end of July. The University of Toronto is offering $100 off for a limited time only. Use the promotion code "JULY 150" for the 150-hour TEFL certification course or "JULY 120" for the 120-hour TEFL certification course to get $100 off.